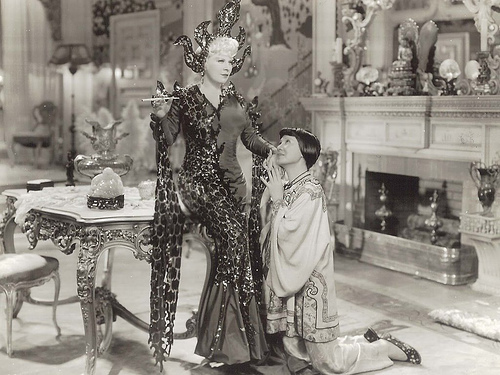 Movie star MAE WEST often appeared in the night life columns. But this item printed on Thursday, 24 May 1956 probably did not sit too well with the screen legend. Soon Jayne Mansfield would be telling the reporters she was "that way" about muscle-bound Mickey. Uh-oh. • • New York — — Earl Wilson wrote: Jayne Mansfield's new romance is with “Mr. Universe,” Hungarian Micky Hargitay, of the Mae West "muscle man” troupe who has medals acclaiming him "the best built man in the world.” They met at the Latin Quarter and, though he’s gone on to Syracuse with Mae, he phones Jayne three times a day and Jayne's agent is helping him become an actor on his own . . . soon. • • Source: Earl Wilson's syndicated column rpt in Desert Sun; published on Thursday, 24 May 1956. • • William Ritt wrote: A Hollywood columnist reveals that Mae West insisted as long as 20 years ago that she be granted television rights in her movie contract. The man at the next desk suggests Mae might now change her old slogan to read “Tune up and see me some time." This item appeared in The Daily Banner on Tuesday, 24 May 1955. • • In the late 1970s Patrick Pacheco took over the editorship of After Dark Magazine and tried to boost the iron content with more red-blooded interviews. In the May 1977 issue, Patrick Pacheco's article on Mae West was printed. The title was: "Ladies and Gentlemen — The Lady, the Lions, and Her Amazing 'Sextette'!" • • In Boston, where Mr. Hearst's American and Sunday Advertiser shot both barrels at Mae West and the production, the Metropolitan Theatre grossed $20,000 last Saturday and Sunday, starting off to a house record. • • Mae West said: "I was snow white but I drifted." • • Sydney, Saturday — — Mae West's new picture, "Klondike Annie," has been banned by the Federal film censorship. • • It cannot be exhibited in any Australian State. In New Zealand, however, the film was permitted to be released. . . .
• • The Mae West Blog was started eleven years ago in July 2004. You are reading the 3448th blog post. Unlike many blogs, which draw upon reprinted content from a newspaper or a magazine and/ or summaries, links, or photos, the mainstay of this blog is its fresh material focused on the life and career of Mae West, herself an American original.